In my time as a music journalist, I've read countless bios for new artists, hoping to find an interesting fact or two I can ask them about in an interview. The more interesting the angle, the more readers are going to care. This week in 1987 saw the ARIA chart debut of a band with one especially exciting fact about them: Madonna used to be a member. No doubt, they were asked about that in every interview they ever did. It would've also gained them way more attention than most other new groups. Would they have been as successful without such a famous ex-member? Who's to say, but I'd like to think their song would've been just as big - since it was one of the year's best. The biggest song in Australia this week in 1987 was still "Slice Of Heaven" by Dave Dobbyn with Herbs. 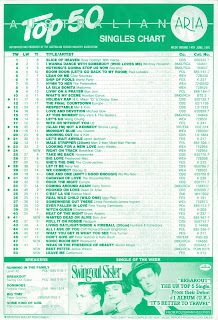 It kept Whitney Houston in the runners-up spot for a second week as it spent its fourth and final week at number 1. If I was reading the bio for Melbourne band Cattletruck, I might learn that their name used to be the just-as-awful Caught In A Cattletruck and their debut single had been the self-released "Never Is" in 1985. 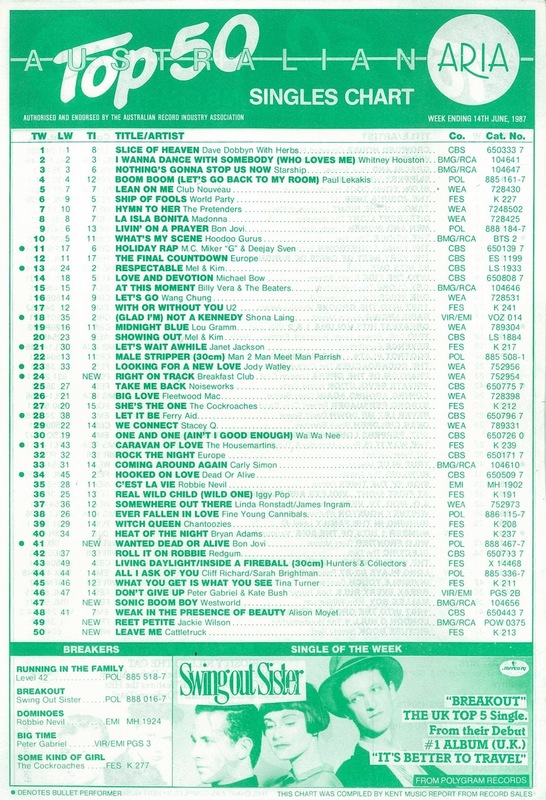 "Leave Me" was their second single through their deal with Regular Records and their first to enter the top 50. Sounding like a cross between Boom Crash Opera and Big Pig, it's a song I liked at the time and wished I owned a copy of now - last time I checked it wasn't on iTunes. Cattletruck would release a couple more singles - "Rain" and "Resurrection Shuffle" - throughout 1987, but never quite took off like those other local bands. It had originally been a number 10 hit in Australia in 1958, and almost three decades later, soul singer Jackie Wilson's debut single returned to the chart thanks to a wildly popular claymation music video which prompted its re-release. In the UK, where the animation was used to advertise Miller beer, "Reet Petite" had been the 1986 Christmas number 1, almost three years after Jackie had passed away. Locally, it only ventured as far as number 20, but it did spend just over half a year on the top 100. Fun fact: "Reet Petite" was co-written by Berry Gordy, who used his proceeds from the song's success to set up Motown Records. Named after the same movie that inspired last year's HBO series starring Anthony Hopkins and a bunch of robots, three-piece British band Westworld just missed the UK top 10 with their debut single, "Sonic Boom Boy". The track, which gave rockabilly a modern (for 1987) twist was easily Westworld's biggest hit, with a string of much less successful releases following it. They were still riding high with "Livin' On A Prayer", which sat at number 9 this week, but the onslaught of Bon Jovi hits continued as the third single from Slippery When Wet entered the top 50. Originally intended as the album's title, "Wanted Dead Or Alive" compared the life of a touring band to that of cowboys in the Wild West and was accompanied by a music video that showed them on the road. A lighters-in-the-air rock ballad, the track was a departure for the Bon Jovi and spawned a trend for late '80s hair metal bands to show their softer, acoustic side. A fully acoustic performance of the song, along with "Livin'...", at the 1989 MTV Music Video Awards was also the inspiration for the MTV Unplugged series, which debuted later that same year and would be responsible for some huge hits in the early '90s. Back in 1979, Breakfast Club was formed by brothers Dan and Ed Gilroy in New York, and featured NYC newcomer (and Dan's girlfriend) Madonna as drummer. 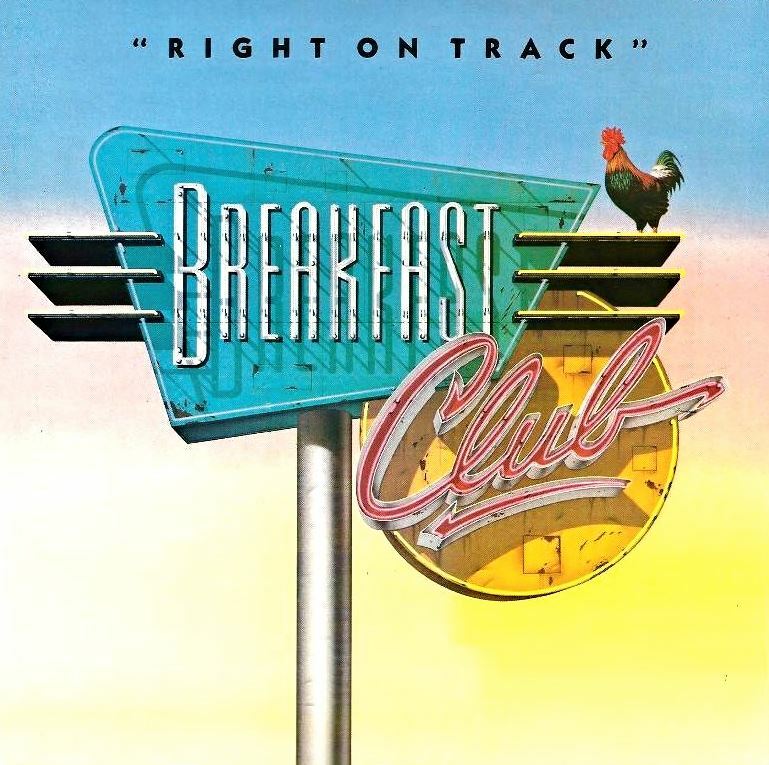 Eight years, several line-up changes and the phenomenal success of their one-time drummer later, Breakfast Club finally hit the chart with "Right On Track". The song was co-written by the band's current drummer, Stephen Bray, who just happened to be another of Madonna's exes, not to mention the co-writer of some of her biggest hits. Naturally, the connection to the Queen of Pop worked in Breakfast Club's favour, but I doubt the song would've been quite as big a hit - top 10 in Australia and the US - if that's the only thing it had going for it. A slick dance-pop tune, "Right On Track" was produced by Jimmy Iovine and came with a zany dancing chicken-featuring music video directed by Jeff Stein, who'd also directed The Cars' MTV VMA Video Of The Year winner, "You Might Think". Next week: a song that finally makes the top 50 after being Single Of The Week twice. Plus, another song with an inventive animated music video. Interesting the Cattletruck video was recorded on Video Hits, as I don't recall being aware of the show until early 1988. I remember seeing the 'Reet Petite' video several times before school as a filler video on (pre-Agro) Cartoon Connection/between shows. 'Blaze of Glory' was basically 'Wanted Dead or Alive' re-written. 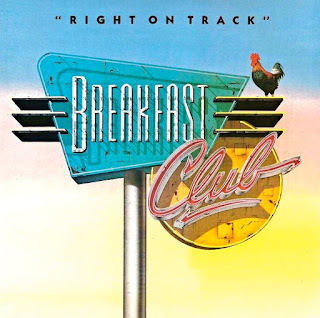 I don't know any other Breakfast Club songs, but based on 'Right On Track', it's a shame that they were one hit wonders. Interestingly, the singer does 'duckface' just before the first verse starts. "Right On Track" is one of the few examples of someone known primarily for working with Madonna enjoying commercial success as a songwriter with someone else. Steve also had a hit with "Baby Love", by Dannii, but other than that, his only hits have been with Madonna. Pat Leonard wrote a heap of songs with Madonna, but his only non-Madonna hit is "Hands" by Jewel. Mirwais hasn't had a major hit outside his collaborations with Madonna. Shep Pettibone has had a lot of success as a remixer, but next to nothing outside his Madonna hits. Stuart Price has had some success, but certainly nothing as big as any of his Madonna collaborations. As for "Right On Track", I absolutely loved it back in 1987 and it still sounds great 30 years later.